Music is magical. It knows a way to express every human feeling and emotion. There’s no language that compares to the communicative power of a musical motif. 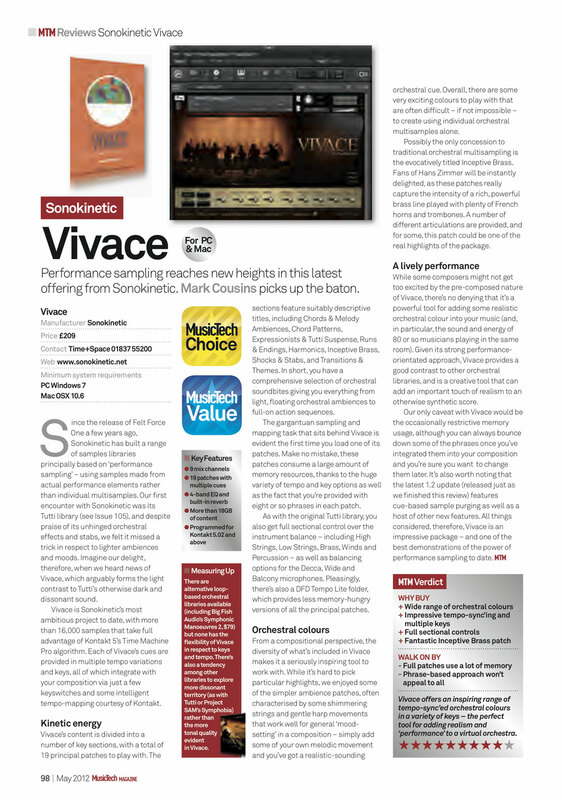 Vivace speaks the tongue of Fables, Myths and Sagas. Get on board and experience a sampling instrument like no other before and enrich your sound palette with exclusive musical colours. 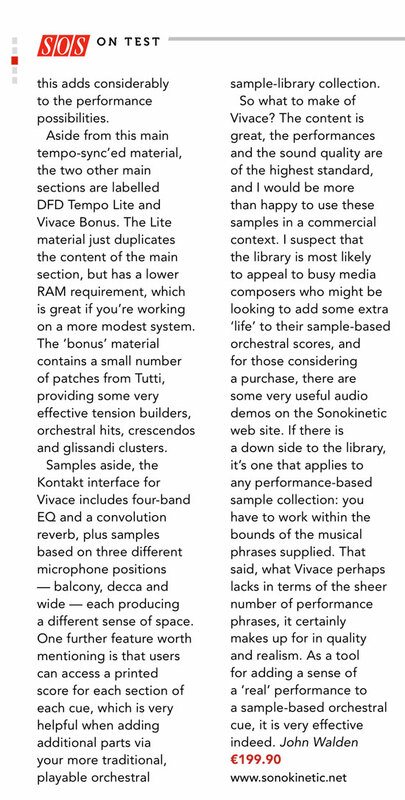 We set out to match and then advance the full orchestral sampling line we began in 2011 with the ground-breaking and highly user-friendly composing tool, “Tutti”. Where that package brought us the dark side, “Vivace” guides us through a magical and mystical land of inspired symphonic cinematic orchestral effects, patterns, atmospheres and moods. 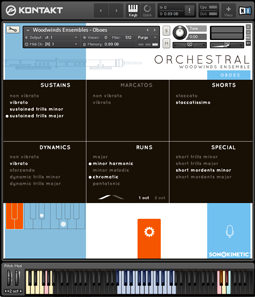 Sonokinetic is proud to set a new standard with this instrument that functions not only as a composer and sound designer’s tool but also as a learning environment: With Kontakt 5 we have upscaled the full score view to provide you with a better look under the hood and guide you through every step in full section score view. 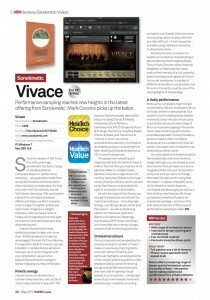 Again, Sonokinetic sticks with its unbeatable pricing module and high quality sampling. This package is priced so competitively it really is hard to resist. 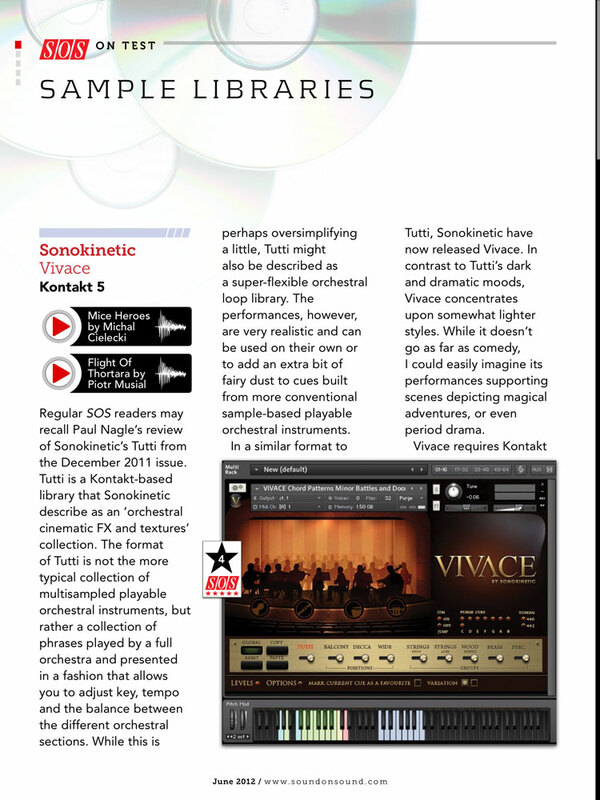 We’re proud to present this instrument to composers of every level as Vivace comes shipped with the free Kontakt Player and appears integrated within the Kontakt Library panel. 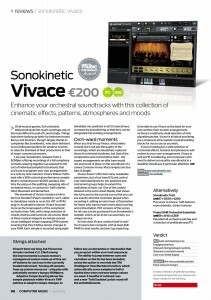 Just as we have been inspired during the creation of Vivace, we hope you are moved by the sonic possibilities to blend new orchestral FX and colours like never before. 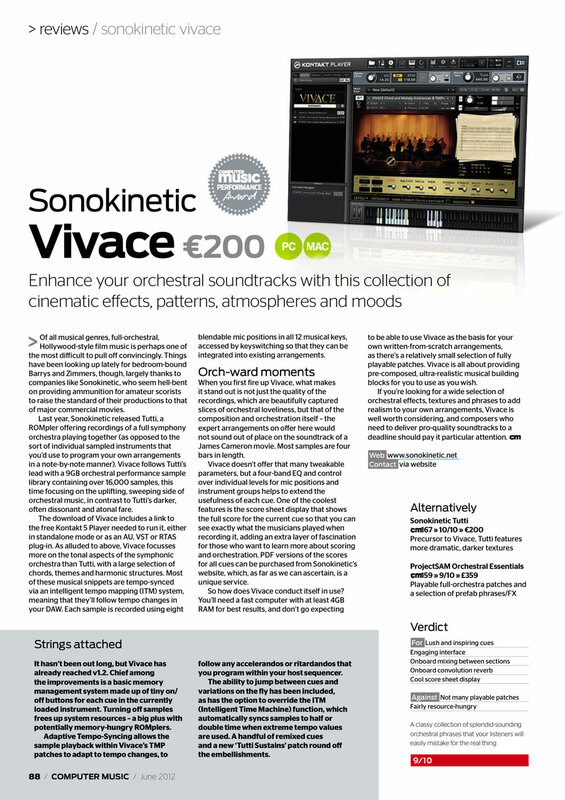 The main Vivace UI consists of a virtual sound stage to the left, and a virtual stack of cue sheets to the right. You can change the orchestral section the cue is showing by clicking the respective icons on the 3D stage. The cue sheets on the right will show the notation for the last cue you played. You can click this stack of papers to view the scoresheet in more detail. To cycle through the 4 sections (strings, woodwinds, percussion & brass) click on the Section up/down arrows at the top and bottom of the cue sheet. 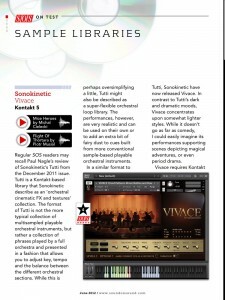 Along the bottom of the UI is a bar that allows you to configure various aspects of Vivace. Clicking the options down here will expand this bar and provide further configuration. 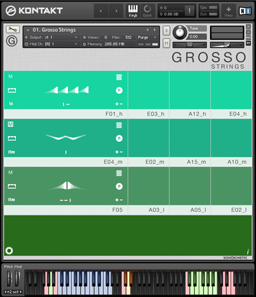 The default setting for Vivace patches which allow multiple keys is that both the upper blue keys and lower green keys will trigger a sample. This can be problematic when you wish to change the phrase and the root key simultaneously. To allow for this playing style we have provided two keyswitches on a low ‘G’ and low ‘A’ that when activated will turn on and off sample triggers for the root keys. The interface then becomes more intuitive for live playing with two-hands: where the left hand can cue up the root key and/or variation and the right hand can then trigger the particular phrase. Below is the modified keyboard configuration for when toggle re-trigger is set to re-trigger “on”. The LEVELS section of the configuration bar allows you to enable and disable individual channels on a cue-by-cue basis and adjust their respective levels. 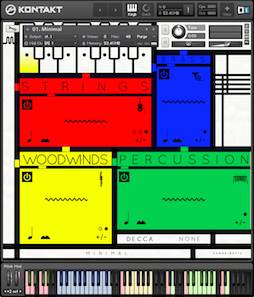 Click on the label above the slider to activate (in this case ‘STRINGS HIGH’ and ‘WOODWINDS’). Not all cues will include samples from all sections so experiment or check the cue sheets for further information about the orchestration. To select a cue, simply press its key to play it. The UI will update to reflect the last played cue. Clicking the labels above the sliders toggles the 3 microphone channels on and off. Note that we have prevented you from toggling some channels simultaneously to prevent phasing. Selecting ‘TUTTI’ will always disable the other sliders to prevent phasing issues. If you would like to manage the mixing levels on a global level you can click the GLOBAL button. Note that by default this button is depressed and your mixer setting will apply to all cues. When active, all mixer sliders appear and the settings you input will affect all cues played. You can copy-paste mixer settings using the provided COPY/PASTE buttons. You can also reset to the default Tutti mix using the RESET button. The OPTIONS section of the configuration bar allows you to configure various global options in Vivace. The EQ section allows you to tweak the levels of the low, low-mid, high-mid and high frequency levels. The REVERB option allows you to set wet/dry levels with an inbuilt convolution reverb. This is useful for auditioning how cues sound with reverb applied. 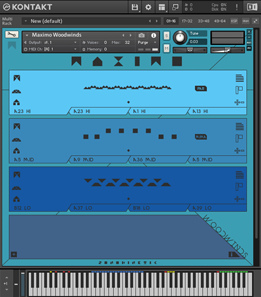 MAPPING MODE allows you to toggle the keyboard mapping for each section patch. By default this is set to ALL CUES. You can click to change this option to FAVOURITES. This option allows you to mark the last-played cue (the one currently shown in the score sheet UI) as a favourite cue. 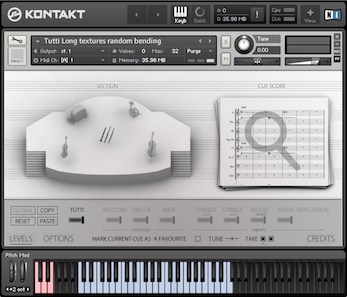 Favourite cues appear at the upper end of an 88 keyboard and are shown in the Kontakt keyboard as green keys. You can think of favourites as shortcuts to your most-commonly used cues. Favourites are remembered when you save an NKI or save your project in your sequencer. The MAPPING MODE option previously mentioned allows you to map the instrument keyboard exclusively to your favourites. 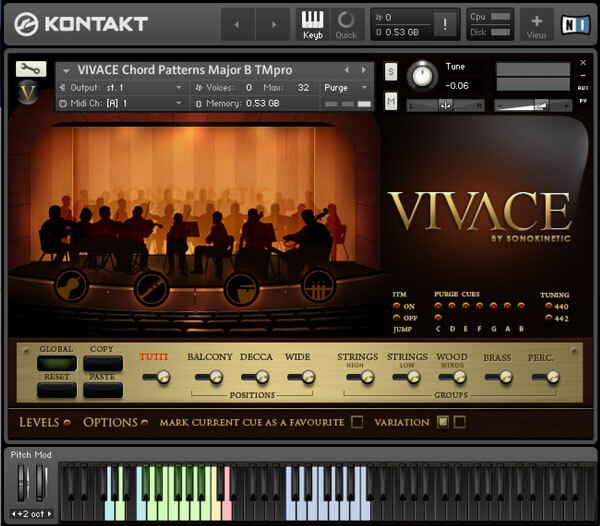 Vivace is an unlocked Kontakt instrument which gives advanced users the opportunity to edit the performance of the instrument from within Kontakt. Please note that the reverb impulse response and stereo spread are scripted within Kontakt and should not be altered by the user. To prevent phasing issues these settings will reset to default with every reload / reboot. 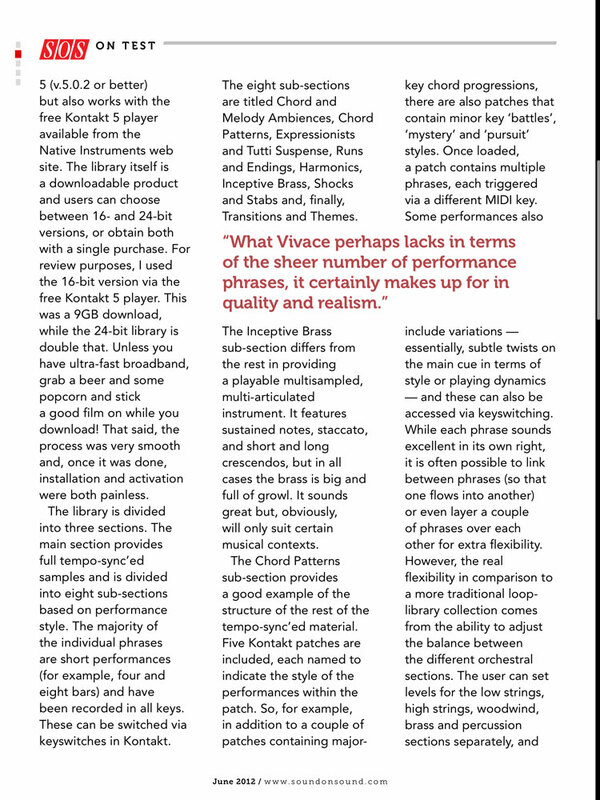 Covers all cues from the “Vivace” library and for the tonal cues the score is in 3 keys. This file has been locked. No copying options will be available. This score only contains the actual recorded keys for all phrases, C, Eb, Ab, Cm, Em and Am. It is provided to you in the concert key (C) version.